← What to mock and why not to mock data objects? Let’s assume that function r() returns a random number in range [0, N) with equal distribution. Let’s examine function f(x) = r() mod x, where x ≤ N. I have faced this problem recently when I needed a random long value in given range – java.util.Random class provides only function nextLong(), there is no nextLong(long max). Let’s split all numbers in range 0 to N into buckets of length x. 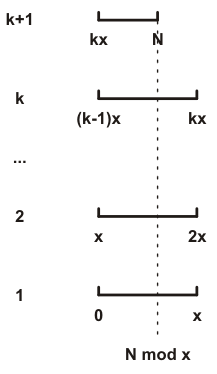 This gives k buckets of length x and a single bucket smaller than x (assuming N mod x ≠ 0). We can easily notice that k = (N - N mod x) / x and last bucket has size N mod x. If the random number returned by function r() lands in any of these k buckets of length x, everything is fine – if we do mod x we will get a number from the first bucket (i.e. [0; x)). But if the number lands in the last bucket, if we do mod x we will get number in range [0; N mod x) which is a smaller section of the first bucket. Each number in range [0; N) has probability of being picked equal to 1/N. However, after we do mod x, each number in range [0; N mod x) will have probability equal to (k+1)/N while each number in range [N mod x; x) will have probability equal to k/N. For example, if x = 2N/3 then N mod x = N/3 = x/2 and k = 1. This means that each number in the first half of requested range will have twice as high probability as each number in the second half. By changing the value of x (relatively to N) the range of affected numbers is changed (e.g. for x ~ N mod x only the last few number in the requested range will have lower probability). And obviously the larger the k is (i.e. the smaller x is relatively to N), the more difficult the bias will be to observe. Worst case time complexity? Two iterations when N mod x ~ N / 2 (i.e. one full bucket and the last smaller bucket has almost the same size). If x is much smaller than N, this loop however will rarely iterate more than once. This solution has one other small flaw that can cause problems difficult to reproduce, but is easy to solve: Math.abs(Long.MIN_VALUE) = Long.MIN_VALUE. Solution is to simply discard this value as well, by changing the condition to value >= n - nmodx || value < 0. Posted on October 11, 2014, in Test Driven Development. Bookmark the permalink. Leave a comment.